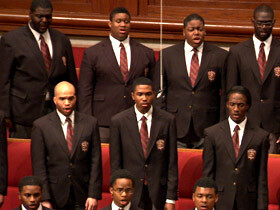 BOB FAW, correspondent: The voices of the Morehouse College Glee Club blend perfectly. The timing, the intonation are masterful. FAW: But listen to the lyrics, and you’ll find there is more here than just music. FAW: Spirituals like this one, performed at a Washington, DC library. FAW: Or spirituals with repeated rhythms of the culture. FAW: This one performed by the Boyd Baptist Church Choir in Rock Hill, South Carolina. These spirituals are melodies and words from a dark chapter of America’s past. UZEE BROWN, JR: What it was part of what I call the survival tools for the African slave. There were many cultures that were virtually wiped out as a result of similar kinds of oppression. But what happens here is that the spiritual is a part of that survival, because they found their way of singing through many of their problems. They found their way of communicating. 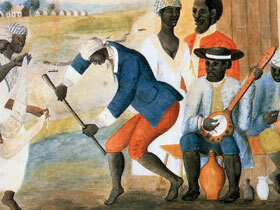 FAW: Slaves in the plantation South drew on native rhythms and their African heritage. For them, spirituals were religious folks songs, often rooted in biblical stories, woven together, sung, and passed along from one slave generation to another. 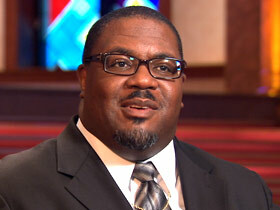 DAVID MORROW (Director, Morehouse Glee Club): And they pulled out stories that worked: Daniel in the lion’s den, you know. The story of Moses, “Let my people go,” you know. All of those things were things that worked out in terms of what they were going through, how they were coping with it. FAW: Listen, for example, to the spiritual “Ain’t A That Good News,” which Dr. Brown sings with his accompanist, Ella Lewis. FAW: It’s a spiritual which makes the present bearable. BROWN: A spiritual that says beyond this world there is victory. I’m going to get my crown. I’m going to be regal. MORROW: “Nobody Knows the Trouble I’ve Seen,” or “Sometimes I Feel like a Motherless Child,” but then there was always that message of hope in them that would allow you okay, this is what my circumstance is, but this is what I can look forward to as well. FAW: Spirituals, which arose at plantations like this one in Roswell, Georgia, were really a double-edged sword. While the melodies might suggest to masters that slaves were happy with their lot in life, if you listen closely you will find the message of some spirituals was clearly defiant, indeed rebellious. 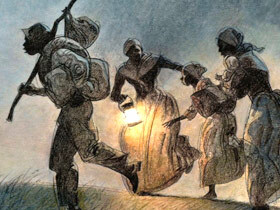 MORROW: The stereotype was that as long as the slaves were singing and dancing, they were happy, and we said we’re good. Well, we can also communicate, you know, “Steal away, steal away to Jesus, steal away home, I ain’t got long to stay here.” There is a lot of message in there, of course, about going to heaven, but also I’m telling you that steal away home meaning I’m going to escape. I’m letting you know it’s going to be soon. You know, we couldn’t very well flat out say it, but we could certainly sing those songs. FAW: This spiritual is both biblical and subversive. BROWN: It speaks of lamps trimmed and burning, as in the reference to Matthew 25, but in the secondary meaning it is we are going to prepare to escape, and you must be ready. These people are communicating from one plantation to the other right under our noses, and in fact organizing in such a way that insurrections were had, and the slave master did not know. These people were not by any means dumb and unintelligent folk who did not understand how to communicate in an effective way through this vehicle since so many others were denied to them. 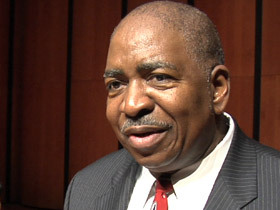 FAW: Spirituals helped to spread the Gospel. FAW: Years later, they were adapted into the freedom songs of the civil rights movement. MORROW (speaking at glee club rehearsal): Not bad, not bad at all. It is just a little brighty in all sections. FAW: And today colleges and churches nationwide still perform them. 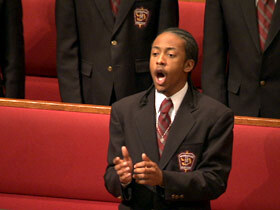 FAW: For soloist Darian Clounts, singing spirituals does more than just rekindle the past. CLOUNTS: What that music is is the music of my ancestors, my forefathers, everything, so that when I feel it, when I sing it, I do feel something deep down within. FAW: In Rock Hill, South Carolina, choir member Connie Hall knows what he means. CONNIE HALL: It connects me with the older generation, because this song I used to hear my grandmother singing, and my mama singing, and it all comes back. FAW: Spirituals live on today not just because they’re a link to the past, but because teachers like David Morrow feel a profound obligation. MORROW: One of the reasons I think it’s important is because every time I teach it it becomes something that they, our students, attach themselves to and connect with. 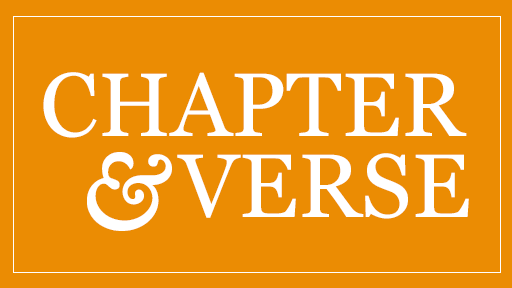 FAW: They live on, too, because even though slavery has been abolished and times have changed, that message of hope, the promise of deliverance, still resonates. BROWN: “Oh, I am a going to lay down of this world and shoulder up from my cross. I am going to take it home to my Jesus, ain’t a that good news. Good news. Shoulder up my cross and take it home to my Jesus. My burdens i will take it to the Lord and leave them there.” Ain’t that good news? FAW: African-American spirituals alive and well, and from this country’s darkest past something glorious. FAW: For Religion & Ethics NewsWeekly this is Bob Faw in Washington, DC.